Spunky and independent, Jay Keller only wants to have fun, having long ago decided that love is reserved for people living fairy tale lives. Kendrick Jordan is a sarcastic, inappropriate smartass whose sense of humor, intense love of family, and serial dating habits enable him to mask his painful past. Through a chance encounter, Jay gives Kendrick a chance to satisfy his curiosity with no strings attached. But when Kendrick’s past catches up with him and Jay is dealt a life-altering blow, they find themselves turning to each other for support. After a traumatic accident threatens their new-found love, Jay and Kendrick must decide if their relationship is worth the terrifying and painful journey they now face. Kendrick has been hiding his demons for years; as time has passed, the pain has only got worse. Ready to face his demons and make a future for himself; Kendrick has to fight and the fight ahead won’t be easy. Has he the strength to succeed? Will the one person he can’t live without stand by him? 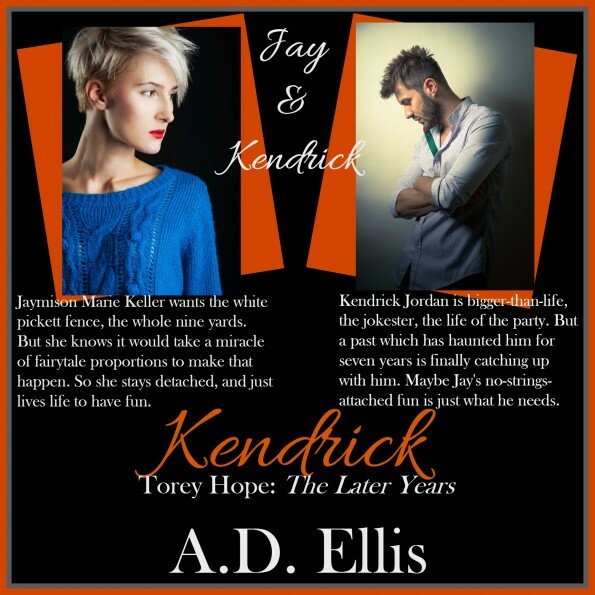 A.D. Ellis has pulled out all the stops with Kendrick’s story. I was really looking forward to reading the last book in the Torey Hope: The Later Years series, Kendrick was always the fun loving one, the one with a heart of gold and always there for his family and friends when they needed love and support, now he needed them and he needed them in ways none of them had imagined he ever would. I never expected his story to be as gut wrenching and emotionally charged as it was. My heart was breaking for him with every page turn, I wanted to crawl into my kindle, hug him and help him to see what was in front of him, to help him heal and to help him live the life he deserved. Kendrick was a strong, open minded, independent and loyal young man. He made mistakes and he faced the devastation and consequences they brought with them. At a young age, he suffered loss and pain that we as adults struggle to face and heal from. He struggled to keep the past a secret, to be true to his word and keep the secret locked inside his mind. Only this secret hurt him too and he deserved to find solace and peace, to heal from the devastation. Before even reading Kendrick’s story, I already loved his character. What I never expected was to find a whole new love and appreciation for the strong and inspiring young man. Jay was an interesting and intriguing character. At first I was unsure of her and didn’t fully trust her, however I was pleasantly surprised and found myself feeling empathy for a young woman who had had a very unsettled upbringing, yet she had determination to enjoy life and make something of herself one day. It was clear how much she loved Kendrick and how much they had changed each other. A.D Ellis wrote about some very delicate and emotionally charged issues in this book with consideration and love; it was clear she had done her research. Kendrick’s story I feel will give hope and inspiration to not only those suffering the same problems as he and Jay but to those who know people who are suffering the same devastations. If you have read the previous books in the Torey Hope: The Later Years series you will without a doubt want to read Kendrick’s story. If you love young adult romances with suspense and storylines true to life, you will absolutely love this series by A.D. Ellis. A.D. Ellis spends the majority of her days loving and wrangling two school-aged children, a husband, and a Yorkie with a stubborn streak a mile wide before heading to the inner city of Indiana to teach a challenging group of alternative education students in grades third through sixth. 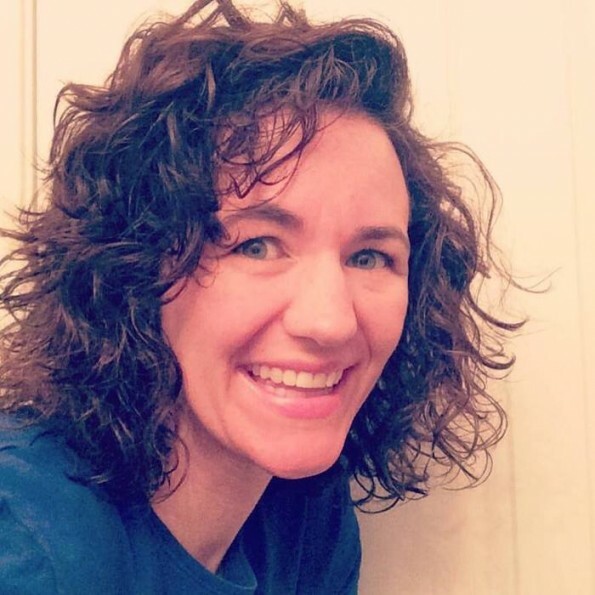 Most days she hits the gym after school in hopes of running and lifting away the stress and headaches of the day before picking up her children and squeezing a whole day’s worth of loving and living into the too-short hours before bed. It’s no wonder Ms. Ellis lives for the slower, easier days she gets to enjoy on breaks from school. Growing up in a small farming town in southern Indiana, A.D. is grateful to her mother for passing along the love of reading. With her nose constantly stuck in a book, Ms. Ellis became accustomed to friends and acquaintances snickering and shaking their heads at her love of reading. A.D. never dreamed of being anything but a teacher, although there are certain times of the year when she laments her career choice. Ms. Ellis had a story idea floating in her head for about a year. After persistent prodding from a friend, A.D. put pen to paper and began writing her first story in October 2013. From that moment on, she was hooked. Taking the people and stories from her head and sharing them with readers is a scary, exhausting, rewarding, and fulfilling experience which A.D. plans to continue until there are no more stories banging around in her mind. A.D. Ellis’ work can be found on both iBooks and Amazon. Thanks so much for reviewing! !